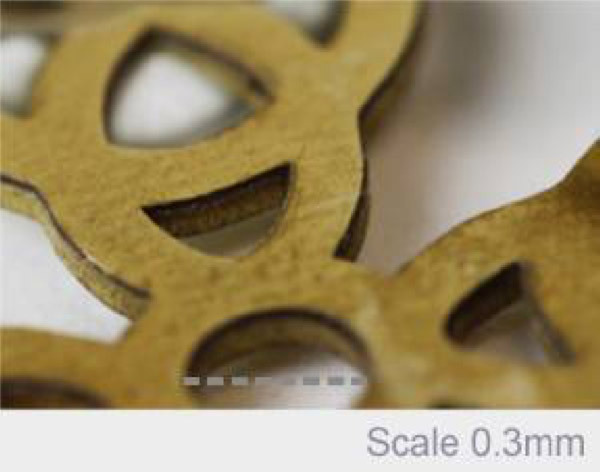 This thickness of brass can be cut using a multi-pass method where the cut is created by ablating through the sheet thickness. With the single mode Laser the spot diameter is small (around 32µm in this instance) which enables a high material removal rate but creates a narrow kerf (cut width). In order to cut 1mm thick sheet material, the beam is wobbled during the cutting process in order to widen the kerf. Initially a wider wobble diameter (typically 60µm) is used, changing to 40µm diameter during the middle of process and then to 20µm towards the end, always using a wobble frequency of 600Hz. This gives an overall cutting speed in the region of 60 to 80mm/min. The workstation used a 75mm BEC which produced an 8.1mm (1/e2) diameter beam at the scanner entrance, allowing a 10mm aperture scanner to be used. The scanner was fitted with a 160mm focal length objective lens which gave a 100x100mm field size. Alternatively, our redENERGY S-Type Laser can be used for cutting materials. Cutting speed is greatly dependent on output power. 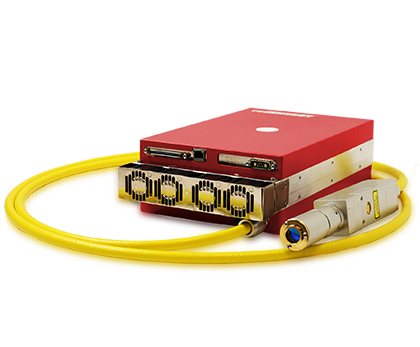 Watch our redPOWER PRISM 1.5kW Cutting 1mm Brass Application Video here!